This is the easiest, quickest, yummiest dessert recipe ever! In a food processor or high speed blender, chop crust ingredients until a fine meal. Reserve approximately 1/3 cup of the crumbs, and press the remainder into the bottom of a serving dish. 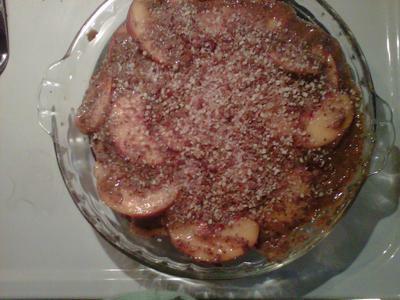 Puree only 1 cup of the sliced peaches in a food processor or blender with the chia seeds and cinnamon. Mix the remaining peach slices with the puree until well coated. Spread peaches on crust. Sprinkle with saved crust crumbles. Join in and write your own page! It's easy to do. How? Simply click here to return to Healthy Recipe Forum.